China isn’t just experiencing an economic boom, it’s revelling in an arts renaissance of sorts. The explosion of visual arts in both Hong Kong and the mainland in recent years, plus the arrival of major fairs including Art Hong Kong and international galleries such as White Cube has shifted the traditional cultural axis from West to East. Michael Lynch is an Australian who is at the centre of this new and exciting creative period in China. Lynch is the CEO of Hong Kong’s West Kowloon Cultural District (WKCD), a magnificent cultural and entertainment district spanning 23 hectares that has been in the works for 16 years. The WKCD was first conceived in 1996 by the Hong Kong Tourism Board to attract more visitors, and to address the lack of modern arts venues. Most of the current arts centres were built in the 1970s and 1980s. After years of public consultations, international design competitions and funding reviews, a master plan designed by Fosters + Partners was eventually agreed upon in 2011. Theatres, restaurants, galleries and the centerpiece M+, a museum of contemporary culture, will surround a vast garden. The first architectural competition (for the Chinese opera venue) is already underway and approval of the master plan from the town planning board should be coming through some time this year. The first arts facility is expected to be ready in 2016 and in the mean time Lynch is doing his best to create as much hype as he can over what is currently little more than a muddy building site, “We are trying to now move it from the talk stage to the realisation stage,” says Lynch from his Hong Kong offices. Lynch has built his reputation on creating momentum and getting people talking. And he says, it’s achieved “by using some dogged Australian bull-headedness to make sure the project gets realised”. Having grown up on Maroubra Beach in Sydney, the young Michael spent most of his third year of life in hospital paralysed with polio. Sixty years on he still walks with a stick – something Hong Kong newspapers have picked up in their cartoon satire. “It certainly gave me a level of visibility and some form of recognition that I’ve been able to create some kind of niche as a rather distinctive character who doesn’t allow physical impediments or other impediments to get in the way of taking on what is an absolute humungous challenge,” he says with the raucous laugh of a man used to poking fun at himself. His university years further awakened Lynch’s cultural awareness but it was in 1972, when he got a job in Labor leader Gough Whitlam’s newly established Australia Council that set him on a course from which he has never looked back. After rising to the top of the Australia Council it was on his first day at work as the newly appointed CEO of the Sydney Opera House that he realised he “was home”. Lynch would have been happy to stay there until the end of his working career but he was offered the CEO position at London’s Southbank Centre and the thought of “testing his mettle against the best in the world” was too appealing. Having worked all his life in Australia, not only was Lynch keen to see how he measured up in the international arena, but also wanted to see if he could make it in what he regarded at the time as the cultural capital of the world – London. Seven years in London saw Lynch turn an antiquated beast into a modern cultural hub. His name as one of the world’s best arts administrators had been cemented. In 2009, the WKCD came knocking for the first time, but Lynch, then nearing 60, decided on semi-retirement and returned to Australia. With a CBE from the Queen, he joined the boards of such major institutions as the Australian Broadcasting Corporation and Victoria Film. In 2011, after the exit of its director, the WKCD came knocking again. Aware of the challenges the job entails, Lynch argues it’s his long career as a cultural problem fixer and his Australian go-get-’em attitude that led to his appointment. “Hong Kong is that curious hybrid born of Britain and ancient China and now overlaid with modern China. That is a challenge for someone who came in and said to them, ‘you know, you’ve appointed me for three years, we’ve got to make progress and to make progress you are going to have to get things out of the way of us to be able to do that.’ So that’s been somewhat of a challenge.” One of the other issues of creating the world’s largest government-funded cultural centre is the complexity of not just building but filling a contemporary art museum bigger than New York’s Museum of Modern Art. Not to mention finding curators and talent to fill four major theatres and dozens of other creative spaces. Lynch is fully confident that when the venues begin to open in 2016, there are “no doubts that we will be able to find the works” to fill them. Lynch spent the last decades of the 20th century helping to shape the growing Australian arts scene before moving to London during its heyday revival when it grabbed global headlines with the YBAs, Brit Pop and the opening of new museums including the Tate Modern. Lynch sees his role as an arts administrator as an opportunity to also reinforce and embed the connections between Australia and China. Lynch argues that despite the obvious difference in terms of political systems, the mutual sense of humour between the Australians and Chinese helps people understand mutual goals, regardless of the language barrier. 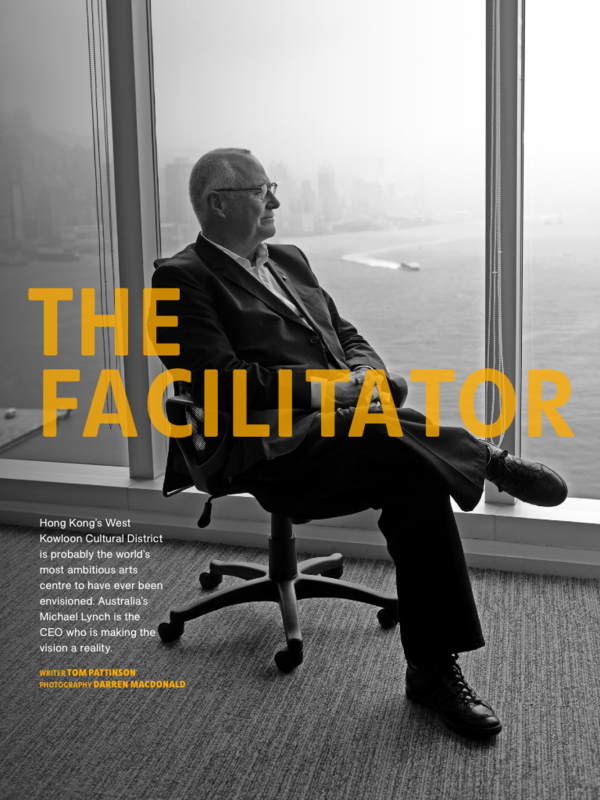 However he is aware that he is in a unique position – working for the Hong Kong government as part of mainland government – to see China through a slightly different prism than if he were to be working for an Australian company or in Australia. A man in the later stages of his career would be forgiven for letting his ego take over and attempting to create a legacy. However Lynch has all the humility of a newly arrived intern, with a can-do spirit of a man half his age and the excitement of a teenager. His candid and honest approach is refreshing. He speaks of “getting things done” and “building a team of successors” who will carry out his dream of creating an exciting cultural landscape for Hong Kong and China.